Inter-hemispheric Integration (IHI) studies how the brain integrates processes that are lateralized to opposite cerebral hemispheres. The perception of global spatial information, such as an object or scene, is preferentially processed within the right parietal lobe, whereas the integration of details (or local features) and language is preferentially processed within the left parietal lobe. By varying the cognitive task (spatial vs. symbolic) and presenting the stimulus either in the right or left visual field, different demands on inter-hemispheric integration can be induced. If a spatial task is presented in the left visual field, it can be directly processed by the right cerebral hemisphere while presentation of spatial task in the right visual fields requires inter-hemispheric integration. Unlike the Simon paradigm which compares the consistency of visual field and motoric response, the inter-hemispheric integration looks at the asymmetry of effects due to consistency between visual field and the to be recruited cerebral hemisphere. This experiment is studying the difference between direct recruiting of cognitive resources vs. inter-hemispheric integration by presenting spatial and symbolic task either in the left or right visual field. 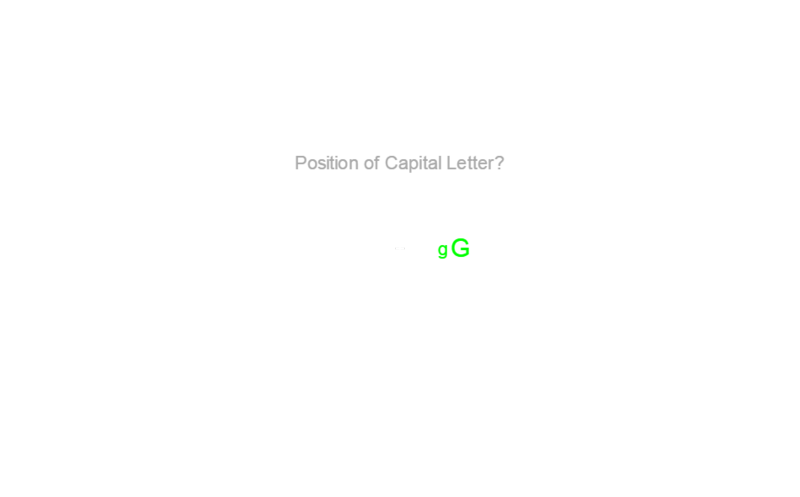 The task is a modified Posner Letter Matching paradigm in which a pair of letters (one lower and one upper case) is presented either left or right from the center of the screen. In the spatial task condition, subjects have to decide which letter is the bigger one. The upper case letter is presented physically bigger than the lower case letter. In the symbolic task condition, subjects must decide if both symbols (lower and upper case) reference the same letter name. This is equivalent to the Posner’s name identity match. The stimulus material has been chosen to be identical for both tasks to ensure that observed differences are only caused by different cognitive tasks. Several studies on psychopathic patients and multiple-sclerosis patients document specific deficits related to IHI. Although the exact cognitive mechanisms are not fully understood, such patients seem to have specific problems in integrating symbolic and spatial information across cerebral hemispheres. Bryden M. Left-Right Differences in Tachistoscopic Recognition: Directional Scanning or Cerebral Dominance. Perceptual and Motor Skills, 1966, 23, 1127-1134. Lopez M, Kosson DS, Weissman DH, Banich MT. Interhemispheric integration in psychopathic offenders. Neuropsychology. 2007;21(1):82-93. Todorow M, Desouza JF, Banwell BL, Till C. Interhemispheric cooperation in global-local visual processing in pediatric multiple sclerosis. J Clin Exp Neuropsychol. 2014;36(2):111-26. Symbolic Comparison Are both letters referencing the same letter name?